Giannis Antetokounmpo returned to the Milwaukee lineup on Monday night and led the Bucks to a 112-99 win over the Chicago Bulls at the United Center. Antetokounmpo had 29 points, 17 rebounds and eight assists, good for his 39th double-double of the season. He returned to action after sitting out his fourth game of the season on Saturday against Orlando, due to right knee soreness. Eric Bledsoe added 19 and Malcolm Brogdon 17 to lead the Bucks. The Milwaukee Bucks put up 50 points in the first quarter and a franchise record 85 points in the first half, on the way to a 148-129 win over the Washington Wizards on Wednesday night at Fiserv Forum. With injuries and a trade earlier in the day, the Wizards were playing shorthanded, having only nine players available. Fans at Fiserv Forum were chanting, “We want 50! We want 50!” Bucks guard Malcolm Brogdon gave them what they wanted, hitting a three-pointer to make it 50-35. The Bucks hit 20 of 27 from the field in the quarter, including 7 of 9 from three-point range. 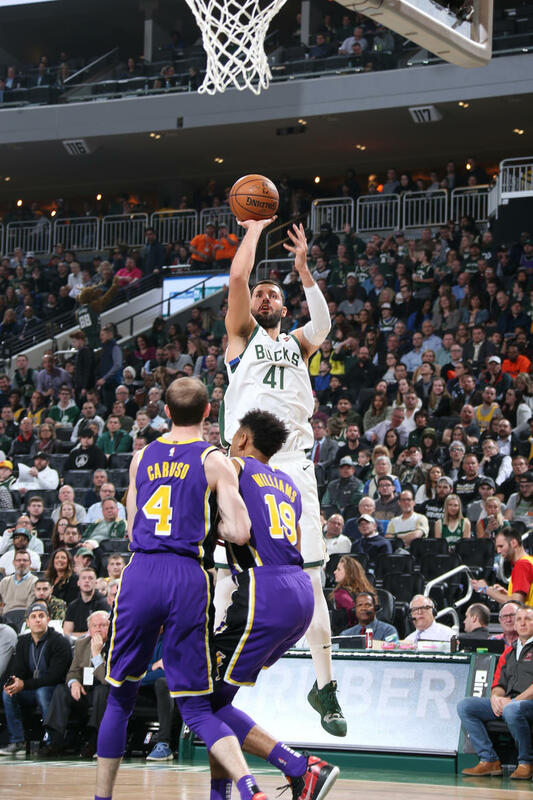 Washington would close the gap to nine points in the third quarter and then got to within 120-113 in the fourth before the Bucks went on a 13-0 run to pull away for good. Giannis Antetokounmpo poured in 43 points to lead all scorers. He went 17 for 21 from the field, including 3 of 3 from three-point range. Eric Bledsoe added 22 points and 11 assists for the Bucks, who won their fifth straight and their 40th overall this season. The Bucks are in Dallas to face the Mavericks on Friday night.